how strongly it's laid on ones heart, how much room is left in the box you're packing, etc. Also how think it is will affect how much room it takes up, I choose to stick with basic cotton fabric as while you may not be able to fit as much in as a thin silky fabric, it's easier to sew with for beginners. One very good question I got was what could be made with a fat quarter, I didn't really know, so I asked my Mom, below are some things we came up with. Dresser Scarf type item to decorate their home. To my sewing readers out there...what am I missing? This is what each kit ended up with-buttons in little holes between inside cases and the seam binding lace out of it's package and folding in the little case with the thread & needles-no room taken up, to leave as much room to fold/squeeze the fabric into. I decided to go with however much fabric I could fit into the cases of the sewing kits, as my boxes are already going to be near bursting! For the above kits that was 1/2-3/4 of a yard, and needed rubber-bands for the most part to be sure they stayed shut. I did have one small kit that I just put in a pack of sample fabric squares, because I loved playing with them as a child, and they could still be used as patches or to piece a small quilt. You can see some of our completed girl shoeboxes here: Examples of 10 to 14 Year Old Girls Operation Christmas Child Shoeboxes. Well Done :) Love the lists of possible creations. This is a great post, Sarah, so helpful and creative! I try for 1 1/2 to 2 yards of fabric so they can make a clothing item. I don't include bias tape but do put in some safety pins. Thanks for your list of things they can make. Great post. I would add several pencil top erasers. I'm glad you enjoyed the post and found it useful! Hopefully I'll have more posts up soon! I have been looking all over for this information. Wonderful job! Please tell me where you find the small scissors that really cut. The cheap ones are so flimsy, yours look just right? Thank you so much. I know I'm a little late to the party, but I was perusing Pinterest. I was brand new to OCC last year and fairly last minute - I decided I'd collect/craft year-round so I can do more boxes in 2016! As a suggestion, I'd move toothpaste to the main list rather than the optional one. I believe it's one of the things OCC recommends, and I feel it's quite important. I wonder if they allow homemade toothpaste? Hmmm. Welcome to the shoebox packing party Adylaid and to the fun adventure of packing year round! I chose to put toothpaste on my optional list because with such limited room I can't put in everything I'd like and from what I've heard from a dentist the toothbrush is more important. Additionally, toothpaste, while still allowed to be sent from the US (which it's not in a number of sending countries as it can be difficult to import, delaying delivery of the gifts), is no longer on the online suggested packing items list (http://www.samaritanspurse.org/operation-christmas-child/what-goes-in-my-shoebox-suggestions/). I wouldn't risk homemade, even if they allowed it one of the volunteer inspectors may be confused and remove it, or an customs inspector in the receiving country might have a problem with it. I find good quality small scissors at Hobby Lobby in their fabric department. As for the toothpaste, it has to have an expiration date of at least a year after the box is packed. genealogyangel-thanks for the hint on the scissors! As far as toothpaste expiration date, the USA OCC website suggests 6 months after collection week, but that is not a hard and fast rule. Two notes concerning previous comments: First scissors - since this will be the only pair of scissors this 12-14 yr old will have, I like to get a good quality that will hold up. Two years ago I found 3 pr of name brand sewing shears on clearance (what a find!!) I sewed quilted scissor holders from potholders and added a note in 5 languages that said "Use only with fabric; do not cut paper." Then also included a pr of kids pointed scissors with patterned & solid color crafting paper in a folder. I wrote about making a folder to fit inside shoeboxes out of 12" x 12" patterned card stock in another comment on this site. Lin K what languages did you use? The languages that I used for the scissors note: Spanish, French, Russian, Romanian, Ukrainian, and Haitian Creole. I based those choices on where our previous shoe boxes had been sent & also guessing which language someone might know if our shoe boxes went to places where Spanish/French might not be known. We're in FL so often our shoe boxes go south of here (Spanish, Haitian Creole) but we've also had some go to European countries. I like to add multiple language instructions for games, crafts, and our family greeting (note we place in each box) too. Where did you find ge little yellow plastic box? What is it? Thanks! Hello! Where did you find the little yellow plastic box? What is it? Thanks! 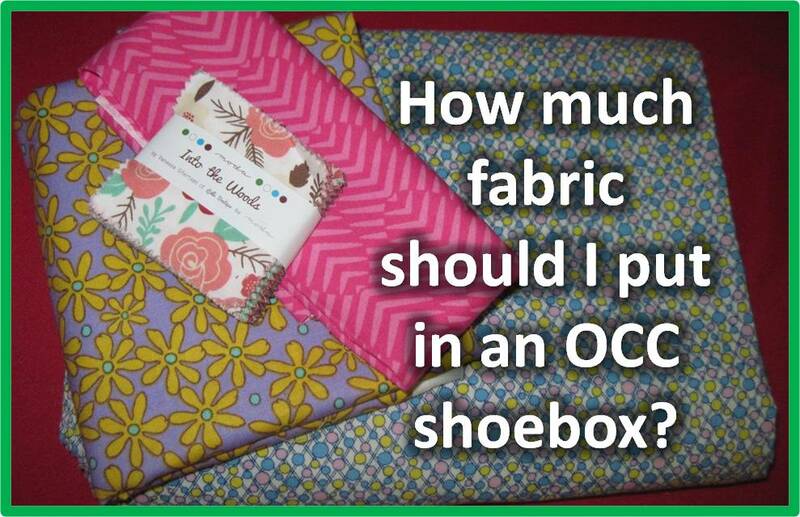 As I was reading through the comments again today I thought of a fabric packing suggestion. Fabric can be rolled tightly and a rubber band or 2 holds it together. Sometimes there's space in a box for a roll of fabric but not for a flat piece. And a roll of fabric can be bent around something else to fit in too. Lace: It's fun to lay some flat lace or trims between the fabric layers before rolling. Thanks for sharing ideas Lin! If you plan to go through your thread stash to add to your box, test it for strength. If it is too old, it will easily break and not be useful.